Back in April, I deconstructed what I thought was wrong with TweetDeck. Now I only do this sort of exercise with products I think show real potential. I did the same on BusyGamerNews.com for the Nintendo Wii user interface and twice for the Xbox 360 (but never got around to the PS3). It appears that someone at TweetDeck is listening. But they have their own ideas too. And it’s hard to tell whether it’s getting better or I’m just getting used to the ever-growing array of columns that stretch off the right side of my screen. The big news is that TweetDeck is now available for iPhone. And it’s free. The column metaphor actually seems to work well with a touch screen where you can swipe to quickly flip columns. I currently trade off between TwitterFon (slightly old version since people dissed the latest update) and Twinkle (nice for community tweets though Seattle lately has been overrun by overly dramatic teens and tweens with iPod Touchs who feel the need to text for attention every 12 seconds or so!). I’ve also toyed with Twitterific but so far it hasn’t stuck. 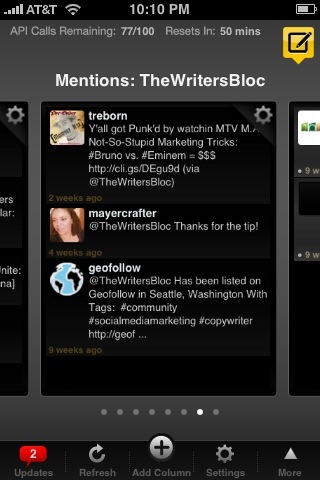 TweetDeck for iPhone looks promising, though it is a little crash prone (not unusual with first gen iPhone apps). What might keep me coming back is this: Sync with my desktop TweetDeck. The way this works is that you either use the iPhone app or the newest PC version of TweetDeck to create a TweetDeck account (yes, another password to remember). You then login to the other version and it offers to sync your columns – to a point. The iPhone version doesn’t support Facebook (at least not yet) so that’s not carried over from your desktop. Nor are any secondary accounts you add. You have to manually add these in both places. And sync’ing doesn’t seem to work from the iPhone back to the desktop, though I could be wrong. I’m still testing this. Wait, did you catch that? Multiple Twitter accounts are now supported – on both versions! Other new desktop app features include unlimited columns, trends for any column, reply all, YFrog support, spam reporting and smart filtering. Supposedly there’s a conversation window, which sounds great - but I couldn’t find it. Still, all in all, TweekDeck continues to show promise. Just when I was about to go fishing for alternatives. This entry was posted on Wednesday, June 17th, 2009 at 12:31 am and is filed under Community, iPhone, Social Networking, Twitter. You can follow any responses to this entry through the RSS 2.0 feed. You can leave a response, or trackback from your own site. Entries (RSS) and Comments (RSS). 23 queries. 0.105 seconds.